Monkeyroom: Easy robe. Not so easy fabric. Easy robe. Not so easy fabric. Ever since our trip to Japan four years ago, I've been meaning to make a Yukata-type robe for my husband. A Yukata is a thin, cotton robe for summer or travel. I finally made him one as a Christmas gift this year. 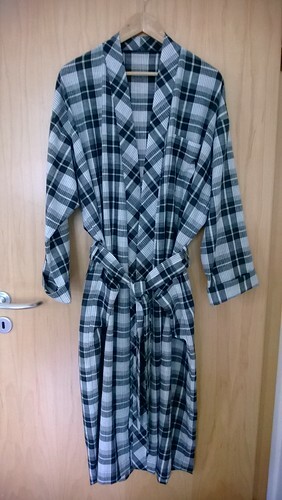 I used an old pattern, Stretch & Sew 2000 "Classic Robes". I made view "B" with the banded collar. The fabric is a lightweight cotton that I got from a get together of my sewing friends (thanks Neefer!). I knew I was taking on the challenge of working with a plaid, but unfortunately I had an additional challenge because I didn't realize the fabric had quite a few flaws in it. I spent way too long matching plaid, creatively arranging pattern pieces, and fixing a hole. Some of the flaws were minor and ok to leave since this is a robe, and it doesn't have to be perfect. Otherwise, the fabric was perfect for this project since it was very soft. I only wish I had a few more yards so I could have made sleep pants to go with the robe. 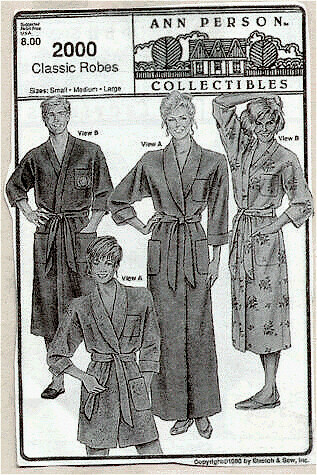 Pattern Description: Shawl collar and banded unisex robes with dropped shoulder, 3/4 length sleeves, chest pocket and two lower patch pockets, belt and belt loops. Three lengths to choose from: mid-thigh, mid-calf, and full length. Pattern Sizing: Small (chest/bust size 30-34 inches) Medium (chest/bust size 36-40 inches) Large (chest/bust size 42-46 inches) I traced off a size between the medium and large since I felt large would be too big but medium might be too small, and I couldn't measure him without ruining the surprise. Did it look like the photo/drawing on the pattern envelope once you were done sewing with it? Yes, although I made the sleeves longer. Were the instructions easy to follow? Fairly easy instructions. The steps are numbered and very clear. They do reuse steps that are the same for both styles so you need to make sure you're on the right one. I sewed the seams on the sewing machine and then used my serger to finish the seam allowances. For the pockets I serged the raw edges first before stitching them to the front pieces. What did you particularly like or dislike about the pattern? It's a basic robe with sizes to fit men and women. I liked the banded version since that is like the Yukata robes. I will use the shawl collar version for myself in the future. Pattern alterations or any design changes you made: I made the sleeves longer. I used the sleeve length for the shawl collar version and hemmed them with smaller cuffs than called for in the instructions. I cut out the band on the diagonal and since it was on the bias I interfaced it to make sure it wouldn't stretch out of shape. I was going to put the pockets on the diagonal too but decided that may make the robe look too busy. I looked online at pictures of robes and didn't see any plaid ones with pockets on the diagonal, so that confirmed that decision. I didn't see many banded plaid robes and most of those didn't do the band on the diagonal, but I'd already cut out the band on the diagonal so I was committed. Now I sort of regret doing the band on the diagonal. Because the plaid wasn't balanced I think it looks a bit wonky. Live and learn! Would you sew it again? Would you recommend it to others? I'm definitely going to sew it again. I already have plans to make the shawl collar version out of fleece for myself. This is a great basic robe pattern. Conclusion: The pattern itself is good, and it's very easy to sew. I made it more difficult by using plaid, but that made it a great project for practicing my plaid matching skills. I'm not quite there yet, so better to practice on a plaid robe than a plaid suit jacket! I realize now that I didn't pay attention to matching the shoulders when I cut it out, and I still have trouble getting the plaid on the sleeves to line up with the body. I'm not to happy with the final look of the diagonal plaid band but had I cut it out on the straight of grain that would have been another area of matching during the cutting process. I did get the plaid to match across the front and sides, and the pockets are almost invisible since I did a good job matching those. All in all I am happy with the robe, and I think my husband is too since he's been wearing it. I think you're being a little hard on yourself, and I know the feeling. I think the robe looks great! I've never dared sew for my husband, so I give you lots of kudos for that. - luckylibber, AKA Heather from the BABES. I'm a rocket scientist during the day but in my free time I enjoy many fiber hobbies: knitting, weaving, spinning and sewing. What can you make with a yard of fabric?